Home from the Council of Priests meeting and catching up on some email and paperwork, I have CTV switched on, waiting for the smoke. 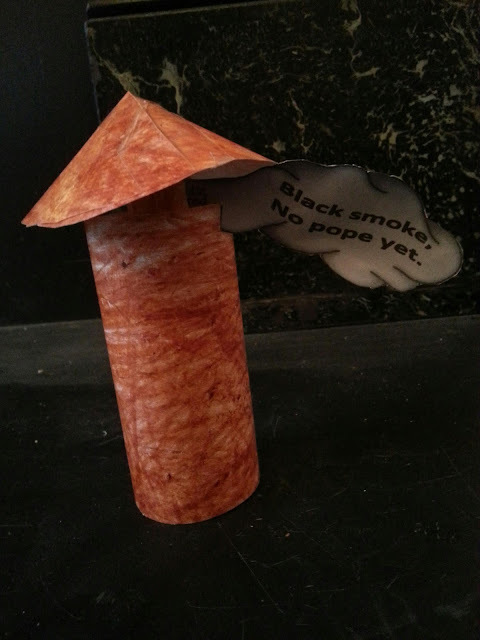 The children of one of my families in the parish have been taking part in the Conclave in their own way, encouraged by their parents. Above you can see the chimney they have made. Go over to Defende Nos in Proelio and you can see the papal flag prepared in the garden, together with a bell that will be rung to alert the neighbours if there is white smoke. 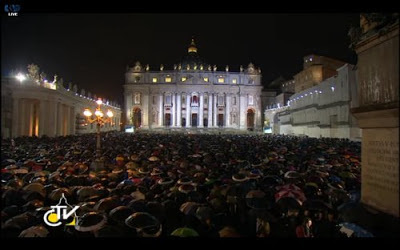 Here is a screen grab from CTV of the enormous crowd gathered in the rain in St Peter's Square waiting for the smoke. UPDATE 1807 GMT: White smoke!! !